← Mod Livin’ LOVES You! Mod livin’ Modern Furniture http://www.modlivin.com/ and Gus* Design Group Inc., the Toronto-based home furnishings manufacturer, today announced the launch of its fifth annual “Keep On Giving!” event, a promotion which offers consumers a discount on modern furniture when they donate to local food banks. 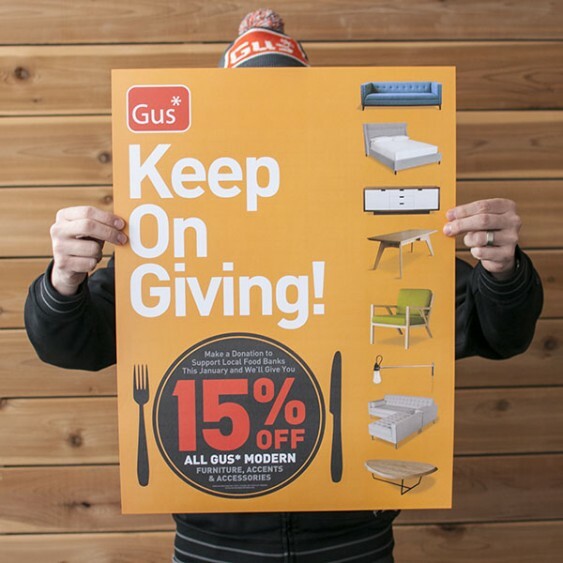 Throughout the month of January, customers that bring 3 non-perishable food items into Mod Livin’ will receive 15% off the MSRP on Gus* Modern Essentials upholstery, dining, storage, lighting, and accessories. Collected food will be distributed by Mod Livin’ to local Denver food banks. “The Keep On Giving Event is designed to encourage all of us to think about those in need in our communities – not just during the holiday season, but throughout the year. Inevitably, donations are collected from customers, friends and nearby businesses that have zero to do with a furniture purchase. This event isn’t just an opportunity to score the couch you’ve been staring at all year, it brings our wonderful community together,” said Amanda Lezan, Mod Livin’ store manager. The Gus* Modern furniture collection is characterized by clean-lined upholstery and functional dining, lighting, and accents, all inspired by mid-century classics. The promotion will apply to all pieces in the Essentials line, which consists of in-stock furniture in a variety of finish options. All of the upholstery frames in the Gus* Modern line, including the great condo-sized LOFT Series, are produced with FSC-certified wood, in support of responsible forest management.